From the author of the New York Times #1 bestseller The Untethered Soul, comes this thought‐provoking and inspiring true story about the magic that happens when you just let go. Since its publication in 2007, The Untethered Soul has become one of the most popular books on practical spirituality in the last decade. But how did its author, Michael A. Singer, who is a man with a master’s degree in economics, the creator of a software package that transformed the medical practice management industry, and founding CEO of a billion-dollar public company come to write this groundbreaking and hugely successful book on spiritual growth and enlightenment? In THE SURRENDER EXPERIMENT: My Journey into Life’s Perfection, Singer tells his extraordinary story of what happened when after a deep spiritual awakening in his twenties, he decided to no longer let his personal fears and desires dictate his life but to simply surrender to what life had in store. This radical decision to follow life’s flow led Singer to both the pinnacle of success and the brink of disaster. 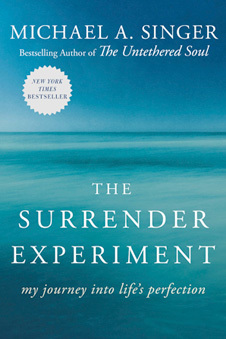 In THE SURRENDER EXPERIMENT, Singer leads readers through a life filled with a seemingly miraculous flow of events. From his years as a young spiritual seeker living alone in the woods, to his amazing success as a self‐taught computer programmer and corporate CEO, to a massive raid by the FBI that led to unfounded accusations by the U.S. government, Singer leaves no part of his story untold. Throughout, he demonstrates how a very successful external life is perfectly consistent with achieving profoundly deep states of inner peace and freedom—if one is willing to remain in the seat of witness consciousness and let go of their personal preferences. As Singer takes you on this great experiment and journey into life’s perfection, the events that transpire will both challenge your deepest assumptions about life and inspire you to look at your own life in a radically different way.